A timeline for the construction says the substation will be operational by 2018/2019. LOCAL COUNCILLOR FOR Lucan William Lavelle has welcomed the news that controversial pylons and overhead cables are to be moved from Lucan and Adamstown. After years of campaigning by locals, the cables and pylons are to be moved as part of Eirgrid’s West Dublin Project, a project which aims to build a new 220 kV gas insulated switchgear substation to supply energy to the Grange Castle Business Park in west Dublin. A map attached of the proposed works. The area of the green line between T1 and T5 will be removed. A long-time campaigner for removal of overhead cables, Lavelle said that Eirgrid’s commitment to meeting with the residents and taking on advice from locals was an exemplary display of how a state body should handle developmental issues. 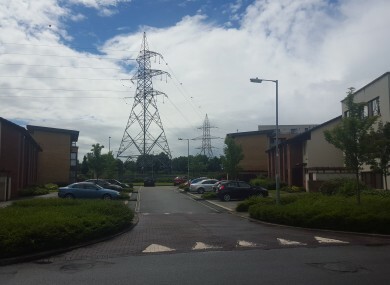 Pylon visible at the Sentinel Buildings, Adamstown Avenue. The pylons are being moved to facilitate the opening of a new 220kv substation, which will add an extra power supply to Grange Castle Business Park – a “fast developing global hub for data centres and high-tech industry” according to Lavelle. Currently, the three-kilometre stretch of cables and towering structures, which affect eight estates in the area, are to be put underground and in a ‘looping formation’ so as to reach the Grange Castle Business Park. The substation itself is due to be operational in 2018/19, and has been built to facilitate new datacentres for Microsoft and Google. This decision comes after years of campaigning and opposition from local councilors and residents, who expressed worry at the “incredibly unsightly” pylons, as well as lingering worries over the long-term health risks of living so close to high-voltage power lines. “I think that in 40 or 50 years’ time people will look back at the health implications of having pylons so close to a residential area,” said Lavelle. Although surveys conducted by Eirgrid have shown that electromagnetic levels in the area are at a safe level, they are slightly above normal. Email “After years of campaigning, pylons in Lucan and Adamstown are being moved”. Feedback on “After years of campaigning, pylons in Lucan and Adamstown are being moved”.